Wow been so busy lately my head is spinning and I have the worse headache. I feel the need to blog. I went to 708(my house that caught on fire Christmas Eve) and got a little done. Tarp on the roof, a couple of windows boarded up, why I swept the kitchen I have no idea. I did manage to pull out a couple of sacred items of the boys underneath the charred rubbish “up-up.” Actually I can’t even believe they didn’t melt. 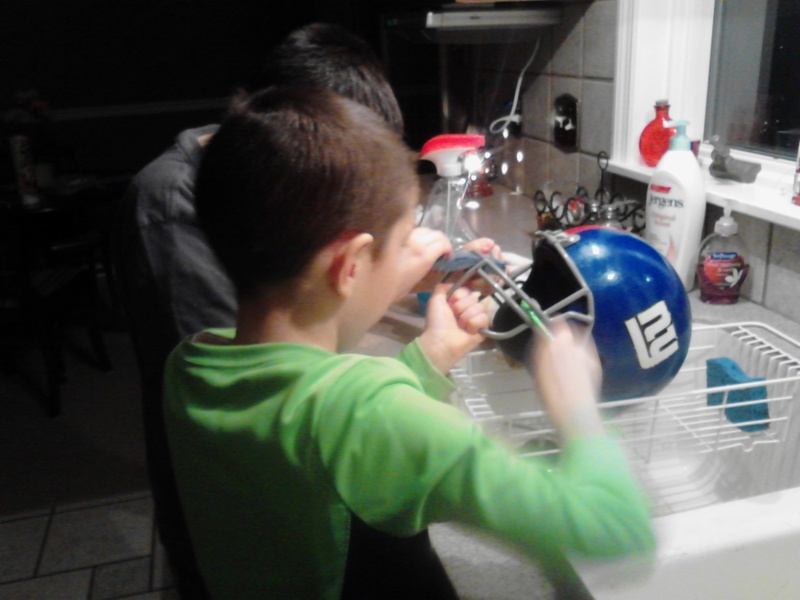 The boys NY Giants costume helmets they wear when pretending to be playing a football game “up-up.” That’s what we called their play area up in the attic. They were black from the smoke and smelled horendous but I brought them home anyway. I don’t think it is possible for me to describe the looks on their face when I told them what I had. Priceless. Jaw dropping, priceless. Made my heart leap for joy for them. We scrubbed and scubbed then voila! Almost back to that sparkley blue that they once were. They were so happy that it almost made me cry. My kids are so amazing and I hate to brag but with everything we have gone through together they have grown into the most respectful, honest, caring, and loving kids I have ever met. They truly make my heart melt. I guess I’m doing something right and hopefully it will carry through.